Extravagance awaits you at The South Charlotte Street Residence. Nestled in the West End between Princes Street and George Street, this fabulous property mixes comfort with splendour to create a unique home from home. With four bedrooms sleeping up to 8 guests, oodles of light and space, and luxury fittings throughout, the South Charlotte Street Apartment is one heck of a find. 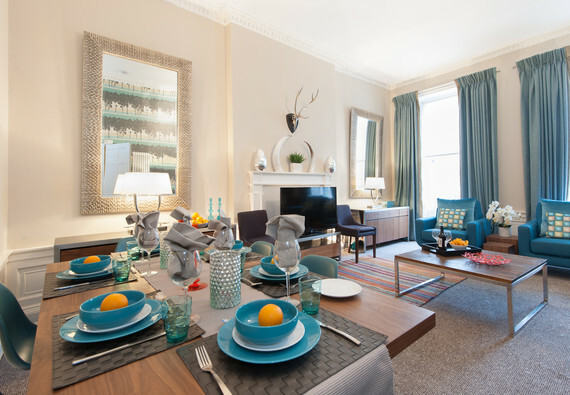 As if the glorious interior wasn’t enough, you’re also treated to a prime location just off of one of Edinburgh’s favourite Georgian Squares, Charlotte Square, with Edinburgh Castle and the Royal Mile just a haggis’ throw away. The very generous living and dining room is decorated in chic mid-century modern with a teal and mushroom palette, and has ample seating, including an extra large sofa and armchairs. Double, full-length windows let in plentiful daylight, highlighting the thoughtful interior design and traditional Georgian features lovingly maintained. A grand dining table allows for a sophisticated sit down occasion if you fancy rustling up some culinary treats, no doubt using fresh delicacies purchased locally. Entertainment needs are also catered for, with colossal flat screen TV and WiFi. The petite kitchen is perfectly formed, boasting minimal, modern design, and all the appliances you could desire, and even a small breakfasting bar. Four sizeable bedrooms invite you in for a soothing night’s sleep, all decorated in calming, neutral tones but each with their own distinct style. Guests can choose from one double bedrooms, and two king rooms, and one twin or king room (adjustable bed), all equipped with storage space, large windows, and two with en suite shower rooms. The family bathroom is yet another slice of modern luxury, and features shower over bath. The local area couldn't be any better. Set beside Princes Street and George Street, shopaholics are in for a real treat; as are culture enthusiasts in search of Edinburgh's most famous attractions, with the Royal Mile, Edinburgh Castle, Old Town and other favourites just minutes away. The popular area of Stockbridge, a quaint village-like district packed with independent businesses and galleries, is around a ten minute stroll North via the tree-lined roads of the New Town. Please note that this property is on the second floor, in a traditional Georgian property and therefore without lift. Please also note there are some building works in the flat downstairs, however only during business hours. Baggage Drop - this may be possible by prior arrangement. Exterior This apartment forms part of a traditional Georgian terrace. Parking notes Metered onstreet parking is available around the area. Interior layout A central hallway with living/dining room, kitchen, four bedrooms and family bathroom all off. Thank you so much for taking the time to leave feedback! We're so pleased that you loved the apartment and it's fantastic location. We look forward to welcoming you back soon. They were helpful except failing to return phone messages and not letting us leave our bags in the hall for 2 hours after checkout. David said we should use the station, which charged £60 for holding the bags and we had to queue for nearly half hour. The service was really good and the communication was satisfactory. Location is perfect. The apartment wasgood and David was helpful and prompt in replying to our requests. The kitchen qas well supplied. Living room size was good. Beds were comfortable. Some parts of the apartment need maintenance.The staircase leading to the apartment was really dusty and dirty.